Home Boxing Boxing Referee Eats Left Hook – Badou Jack Does It Again! 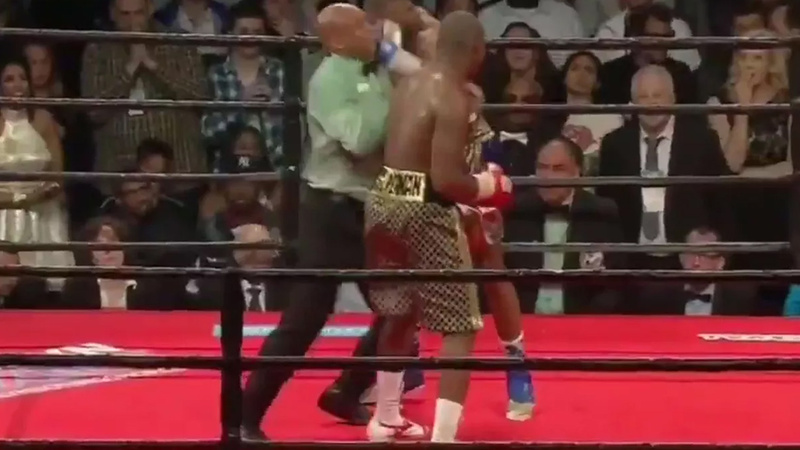 Boxing Referee Eats Left Hook – Badou Jack Does It Again! Looks like Badou Jack has gone too far with his reign of terror and couldn’t make the difference between the referee and his opponent. Badou Jack Vs Adonis Stevenson was a WBC Light Heavyweight title shot. The fight ended in a majority draw but it will be known forever by a highlight unspecific for boxing competitions – punching referee! Halfway through the twelfth round, the referee stepped in the break fighters up but Badou Jack had other things in his mind. The referee received a strong left hook to the chin! Badou Jack held out his gloves showing repentance but the ref didn’t waste a single moment. He just gave a signal to both fighters to return to fighting. This referee probably has a chin made of iron! The fight was scored 114-114, 114-114, and 115-113 for Badou Jack. This is his second draw in the last three fights but now he is a legend for teaching referee a lesson. Adonis Stevenson retained his WBC belt… Did this accidental punch cost Jack his title? You know what is the strangest thing? This is not the first time Badou Jack hit the wrong target! He caught the referee Artur McKinney in January 2017 with a similarly left hook. This referee wasn’t that much pleased. Take a look at the video. This referee doesn’t have that strong chin, he was rocked heavily. Maybe Jack should have started counting?